The story relates to the journey of the seven sisters that make up the star cluster known as the Pleiades, in the constellation Taurus. Mythological stories of the Pleiades also cross many other cultures outside Australia – the story also appears in ancient Greek mythology. Observed from central Australia, the Pleiades star group rises above the horizon soon after sunset and keeps a low trajectory above the horizon. Perhaps for this reason this relatively small star cluster takes on extra importance, as it appears to launch from the earth’s surface and make its journey in close proximity to the land. In the Seven Sisters story in Aboriginal Australia, the group of stars are Napaljarri sisters from one skin group. In the Warlpiri story of this Jukurrpa, the sisters are often represented carrying the Jampijinpa man Wardilyka, who is in love with the women. Then the morning star, Jukurra-jukurra, who is a Jakamarra man and who is also in love with the seven Napaljarri sisters, is shown chasing them across the night sky. They are seen to be running away, fleeing from the man who wants to take one of the sisters for his wife. However under traditional law, the man pursuing the sisters is the wrong skin group and is forbidden to take a Napaljarri wife. So the Seven Sisters are running away from the Jampijinpa man, they travel across the land, and then from a steep hill they launch themselves into the sky in an attempt to escape. But the Jakamarra man follows the sisters into the sky, travelling in the form of a star seen in the Orion’s Belt star cluster, which is also seen as the base of the Big Dipper. So every night the Seven Sisters launch themselves from earth into the night sky, and every night the Jampijinpa man follows after them across the sky. The traditional custodians in Central Australia for this story, called the Napaljarri-warnu Jukurrpa, are the skin groups of Napaljarri and Nungarrayi women, and skin groups of Japaljarri and Jungarrayi men. There are some parts of the Napaljarri-warnu Jukurrpa that are deeply connected to sacred men’s ceremonies. In part of the Star Dreaming story called Yanjirlpirri Jukurrpa, (Jukurrpa means from the Dreaming) the narrative gives an account of the journey of Japaljarri and Jungarrayi men who travelled from Kurlurngalinypa (in the north near Lajamanu) to Yanjirlypirri (west of Yuendumu) and then on to Lake Mackay on the West Australian border. Along the way they performed Kurdiji, which are initiation ceremonies for young men. Women also danced for the Kurdiji. The central site depicted in this story is Yanjirlypirri, which means star, a site located around a low hill and a water soakage. This site is highly significant, a ceremonial place where young boys are brought from all parts of the desert, from Pitjanjatjara country in the south to Lajamanu in the north, for Law initiation ceremonies. 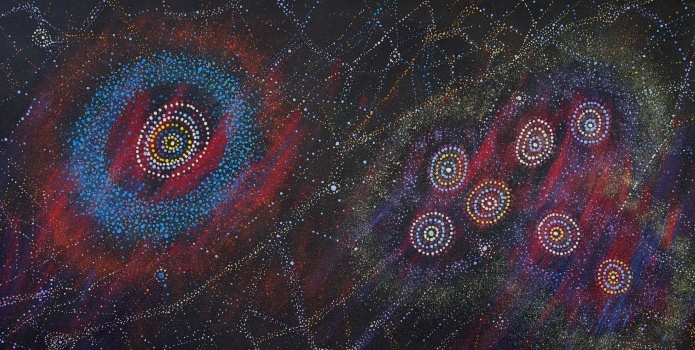 In Aboriginal Australia the stories associated with the stars and night skies carry meanings which probe deep into the law and culture and social structures of the people. As the artists represent these subjects they are also maintaining the stories and the keeping the meanings strong within the group.